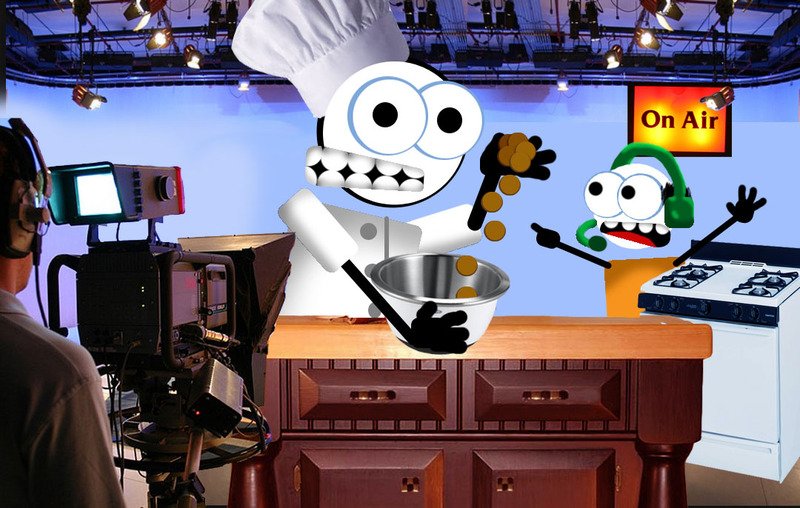 Welcome to Cooking with Rent A Friend! Today we’re going to be making an easy recipe that everyone will love! We’re going to be making some cookies. This is an old family recipe; it goes all the way back to our first parents Adam and Eve. But don’t worry- this isn’t Grandma Eve’s Apple Cobbler Surprise! We’re making a batch for the King today, and he’s going to be here in the studio to try them! So we need to follow the recipe and do our best. First you will need a big bowl- this one is a “Lifetime”. This bowl is big enough to put in a lifetime of ingredients, and it starts out completely clean. You have to keep out anything dirty or it affects the whole batch! Like it says on the box, it’s not the size of your Lifetime that matters- it’s what you put in it! We’re going to start with some common basic ingredients. Here’s the flour of material existence, the eggs of biological life, and the sugar of self-awareness. Add a pinch of free-choice and some vanilla extract, and you’ve got the start of a really good batch of cookies! HAL [off screen]: Wait! Don’t do that! HAL: Those aren’t coco puffs. RAF2K: Aren’t they? My production assistant, Hal, tells me that those weren’t chocolate chips or coco puffs. What were those? RAF2K: Uh huh… bunny cleaning day… right… OH! That bag was bunny litter? But they look a lot like coco puffs. Look, it’s close enough. Small, round, brown… Look! Besides, it’s MY bowl, I can put what I want into it. I only need to add another handful to get this to look right. [adds another handful] There, that’s all I’m going to add. That’s not a lot, and it’s for a good cause. HAL: Does the recipe allow.. uh.. substitutions? RAF2K: I donno, let me check…..
HAL: Because I’m pretty sure it forbids the use of bunny poops at all, even to give the appearance of chocolate chips. RAF2K: Hmmmm… Oh yeah, the recipe does say that- right here. “Do not add ANY bunny poops to this recipe.” Weird. I even had it underlined. Ah well, I can fix this. Cooking with Rent a Friend will be right back. Voice Over: From OT pictures comes Isaiah 64. He’s a prophet from the east, come to tell the people that they have earned the wrath of God. They were a culture of religious people who thought their good works could remove their sins. They didn’t see how their wickedness could infect even their goodness, but the prophet came to set them strait. Isaiah: All of us have become like one who is unclean, and all our righteous acts are like filthy rags! Voice Over: Isaiah 64. See it for yourself. Playing now at all OT theaters. RAF2K: Welcome back to Cooking with Rent a Friend. I’m making cookies for the King, who has joined us in the studio! [audience applause] I’ve been raiding the pantry and I’m trying to make my cookies acceptable to the King. Excuse me, your majesty, but what would I have to add to get you to eat these? I think I have strawberries in the fridge. KING: I’m sorry Rent a Friend, but there is nothing you can add to those cookies to make me eat them now. RAF2K: Brown sugar? Blue berries? Raisins? Raisins look kinda… well, similar. KING: It’s not the appearance that concerns me. It’s the substance. You put bunny poops in your bowl, and no matter what you add to it now, they will still be there. Your cookies are ruined and your bowl is dirty. The whole batch now has been tainted with poops. Your king cannot accept poop cookies, no matter how sincere the cook. RAF2K: But… what am I gonna do? I only have this one Lifetime! Oh, man! I’ve ruined my cookies before they even baked! Can anyone help me! Can anyone take the poops out of my cookies? KING: I can help you. RAF2K: You? Oh, no, I couldn’t ask you for help. You’re the King! I’m supposed to make these for you. Besides, cleaning up after my messes is beneath you. KING: My dear Rent A Friend, I’m offering my help to you. Here- I brought my own golden mixing bowl- it’s an “Eternal Lifetime”. Would you like me to help you? RAF2K: I have the recipe here. KING: Oh, I don’t need that. I wrote this recipe. I gave it to your grandmother and grandfather. RAF2k: Really? I didn’t know they knew you that well. KING: Oh, sure. I owned that garden they worked in you know. I actually planted all of those trees myself. KING: OK, here’s a clean bowl with some fresh new cookie dough in it. Now you can add some goodies into it. RAF2K: Wow, I don’t know how I can thank you enough. KING: You can start by letting me wash these hands before you stick them into the bag of chocolate chips. RAF2k: Oh, thanks! Hee hee! The King is washing my hands! Kinda tickles… OK everyone, we’re about out of time for today. Tomorrow the King’s first-born son is going to join us and show us how to make a delicious breakfast fish sandwich. Keep your bowl clean! KING: And when you don’t- call me! RAF2K: And we’ll see you next time on Cooking with Rent a Friend! Today’s show was brought to you by the GOSPEL, which means “Good News!” OT’s Isaiah 64, and the letter S- “Sin cannot be removed with good works.” This has been Cooking with Rent a Friend on the Rent a Friend 2000 Network. This entry was posted in Jesus and the Bible and tagged The Gospel. Bookmark the permalink.